Equine-assisted therapy is an emerging treatment method with scientific studies proving dramatic success using horses to heal humans of mental and emotional pain. The horsesandhumans.org research company is just one of nearly one-hundred sites that prove up to 80% improvements in adults and children suffering from depression, anxiety, bi-polar disorder and other illnesses. The path to healing begins with a diagnosis. By their very nature, horses provide the perfect way to learn what problems people might hide from everyone around them -- even themselves. For thousands of years, horses have honed their instincts as prey animals. These senses allow them to detect the emotions and intent of everything around them, up to and including humans. When a visitor to Wildfire Ranch interacts with a horse in a therapeutic setting, the horses begin to unmask the hidden emotions and difficulties that might not be so easy to see. 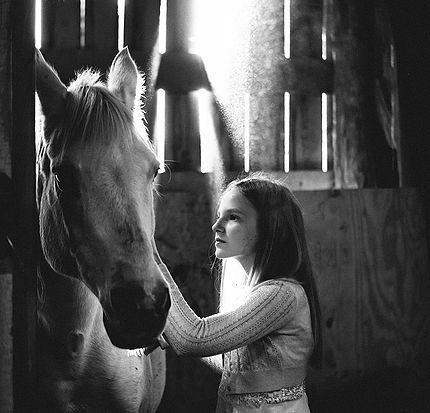 The insight that horses offer provides a unique window into the human experience. Combined with the powerful, calming experience that is horse therapy, many people find their lives changed. Regular therapy with horses produces increased self-confidence, happiness and awareness of power and self-control even more than dog and cat therapy. At Wildfire Ranch we firmly believe that God works through our horses to produce supernatural healing for our guests. The horsees unmask deep emotional problems with their remarkable senses and then mirror that 'diagnosis' back to the human with their behavior. Interested in learning more about equine-assisted therapy? Learn more by visiting our Therapy page. Sure, we are confident in our ranch and what we have to offer, but no one says it better than those who have already visited. Be sure to read what others have to say about Wildfire Ranch!